Almost a perfect fit, but it worked anyway. I could not find my machines serial number in the data so I picked the nearest. My filter had three mounting bolts this has two. Two are enough. The part looks good and works great! The shipping cost was a little HIGH! Went on without a hitch. This was accurately id'd on the web site and fit perfectly. But, as a non-professional, a schematic of the many gaskets and exactly how they fit would be helpful. This is because when I removed the two bolts that seemed to hold the old unit on, the carburetor, shield, and many gaskets all slipped down or off because the two bolts were holding everything together. But of course, I am not a professional and move into these situations at my own peril. Thank you for the chance to vent. Worked very well, Just make sure that if you buy this product that you buy the gaskets for the carburator with it. They are very important in the honda engines. And make sure they are in the right order otherwize the engine will run lean if at all. I broke my housing by crashing into a fence. Jack's had it at a great price with fast service. Original Honda parts. 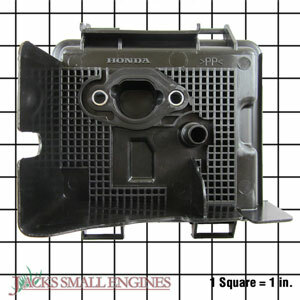 Ask us about the Honda 17220ZM0030 Air Filter Housing. Please no repair questions. Your Q&A may be posted to Jackssmallengines.com to help other shoppers, like you, with their purchasing decisions. Thank you.